It’s almost the end of Meatless May. As it turns out, May has been a month full of the letter M for us. Meatless-ness aside, we’re also dealing with these other M words: manic, madness, meticulous, and … MOVING. Gardner and I have been living in manic mode lately (mode! another M!). We’re surviving, despite the madness, and have meticulously packed mountains of boxes…because we’re MOVING! Where to? Richmond, VA. When? This Saturday. As in – the day after tomorrow. Yeah, it’s a little nuts. We’ve been packing and packing and packing and are now just hoping for good weather on Saturday. You can blame our lapse in posting recipes on our move. Or you can blame our laziness and lack of dedication, but that’s not very nice. 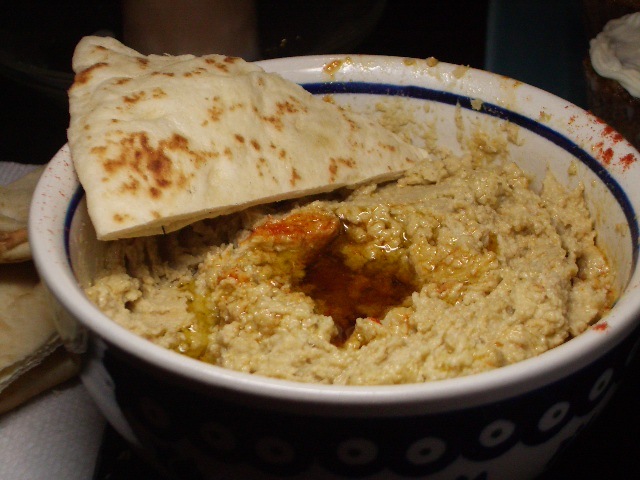 Here’s a hummus recipe to tide you over for a few days… it’s easy and tasty and meatless – perfect for this manic month of M’s. This picture makes the hummus look a little funky. But it was loads better than grocery store hummus and also much more frugal!